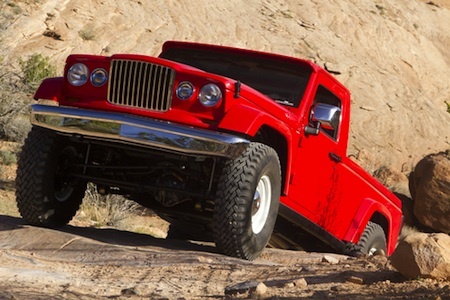 Classical Jeep styling cues in a pickup truck frame. A concept Jeep J-12 with heritage good looks. Reviewing this years Jeep Safari Moab concepts, we turn our lens towards the J-12 Concept from Mopar, a pickup truck that may also answer the consumer call for diesel-powered models. The Jeep J-12 Concept strikes a rare balance of classic and avant-garde styling that most concept vehicles are unable to achieve. Its trim and powertrain boast truly innovative thinking in automotive design and manufacturing. At one glance, off-road enthusiasts and the uninitiated both will recognize this vehicle’s quality in craftsmanship. The J-12 is outfitted with 36-inch all-terrain tires. Jeep and Mopar are not only looking at different lifts and axles, but also have varying configurations in mind for the hood, heat displacement, exterior colors and interior fabrics. The concept Jeep is outfitted with Chryslers 3.6-liter V-6 engine, the same motor found in virtually every larger Chrysler product built today. Jeep fans have long been begging for a diesel, but so far the answer has been unclear at best with European customers given a 2.8-liter diesel four for the Wrangler. At the Moab event Jeep officials hinted that a diesel option was possible perhaps even for this Wrangler-derived concept. The 2012 Wrangler Unlimited serves as the baseline for the J-12, its frame extended 18 inches to allow for a 6-foot long truck bed, while reserving space for the spare tire under the bed floor. 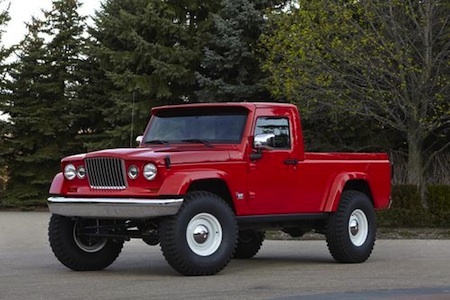 As an acknowledgement to classic Jeep Gladiator series enthusiasts, Jeep’s design team created a custom hood and front fender flares for the J-12. Mopar also ramped up the J-12’s off-roading capabilities with the exciting addition of the new Mopar 3-inch suspension lift kit, as well as Teraflex sway bars controlling ARB air-locker equipped Dynatrac D-44 and D-60 axle assemblies. And the J-12’s classic 36-inch tires mounted on 16-inch steel Jeep wheels gives it phenomenal traction over the gnarliest of terrains. And Jeep knows that it is important to hit those gnarly Moab patches in comfort and in style. The J-12 concept’s cabin has been designed with a minimalist approach in support of a basic truck theme, with a rugged truck bed liner replacing the interior carpet. The bucket seats have been fashioned into a modernized bench seat, trimmed in a unique, original red and white plaid pattern. A Mopar fuel-filler door, Mopar slush mats, Tom Woods custom driveshafts and Katzkin seat trim complete the J-12 concept Jeep. Like most concepts, the J-12 may never see the light of day. However, enthusiast feedback has been very positive with message boards lighting up with build this now! remarks. Given that the entire Chrysler Group is on a roll, it seems possible that Jeep will someday make the J-12 concept a reality. Photos courtesy of Chrysler Group, LLC.